PREMIUM MATERIAL: This Makeup Bag is made of high quality Oxford Fabric, Lining-nylon. (Note: Cosmetic Accessories Not included). 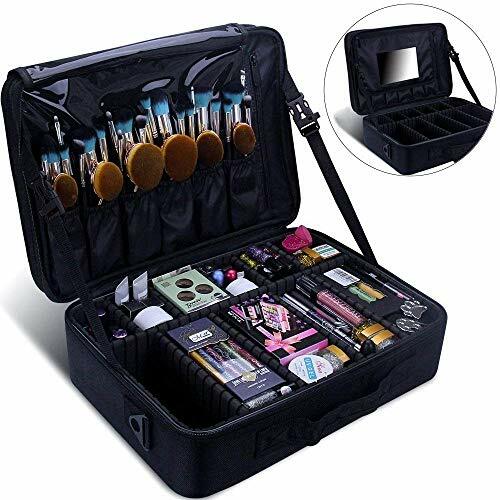 PLENTY OF STORAGE SPACE: This Makeup Bag have enough space to storage your makeup and cosmetic accessories, like lipstick, lip gloss, makeup brushes, eyeshadow, makeup palettes, hairbrushes, skin care products, nail polish, nail art tools, shampoo and so no. ADJUSTABLE COMPARTMENTS: This Makeup Bag have several compartments and makeup brushes slots, you can keep your makeup tools is neat and tidy. Special design adjustable compartments, you can adjust as needed. PERFECT TRAVEL MAKEUP CASE: Portable and Lightweight design, with waterproof, shockproof, anti-wear and spill-proof interiors. You can bring your cosmetics to anywhere. MULTIFUNCTIONAL MAKEUP BAG: This Makeup Bag not only can storage your cosmetics, but also Jewelry, Electronic Accessories, Camera, Essential oil, Toiletries, Shaving Kit, Valuable objects and so on.